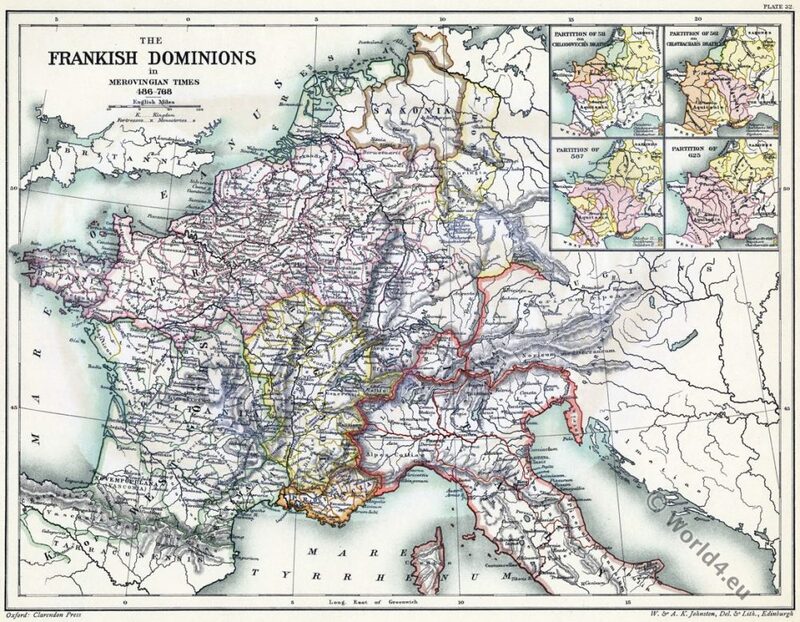 The Frankish dominions in Merovingian times (486-768). This entry was posted in 5th Century, 6th Century, 7th Century, France, Gauls, Middle Ages, Nobility and tagged Maps, Merovingian fashion and history on 10/21/16 by world4. 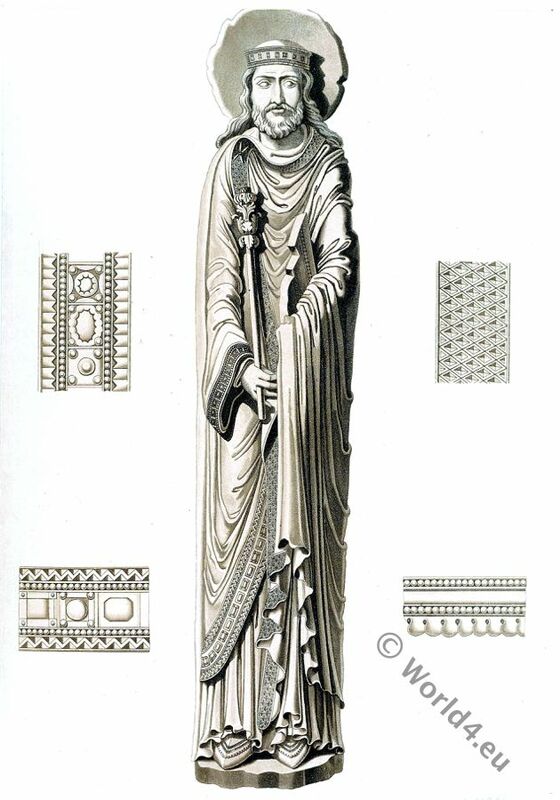 Clovis I. 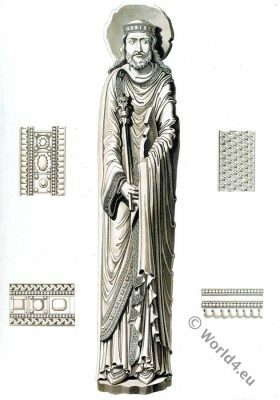 (466-511) also Chlodowech Latin: Chlodovechus; Frankish: Hlōdowig; German: Chlodwig I.; French and English: Clovis; was a Franconian king or rex from the Merovingian dynasty. CLOVIS I. KING OF THE FRANKS. Baptême du fort Roi Clovis. Fragment d’une des Toiles peintes (XVe Siècle) de la ville de Reims. 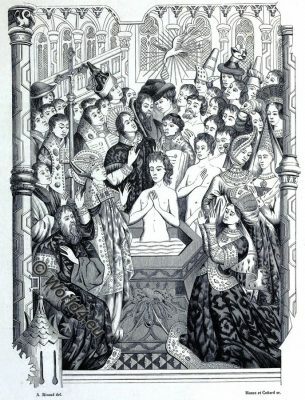 Baptism of King Clovis. Fragment of one of the Tapestries (15th Century) of the town of Rheims. FOR the preservation of this statue, and the one supposed to represent Clotilda the queen of Clovis, we are indebted to the zeal of Alexandre Lenoir, who placed them in his museum of national antiquities. 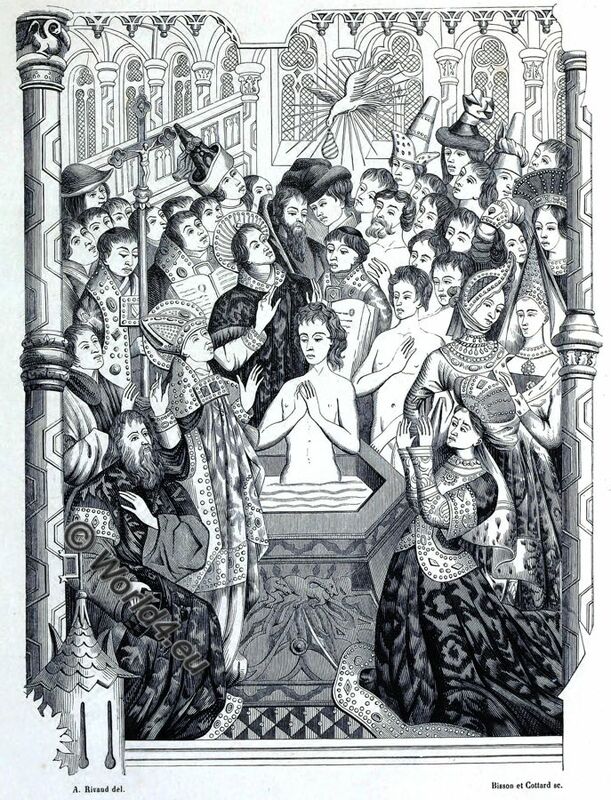 They formerly stood, with four others, at the portal of the ancient church of Notre Dame at Corbeil, a town about twenty miles to the south-east of Paris. But their companions perished with the church they embellished, and these figures, the only remains of its former magnificence, have been transferred from the museum to be placed at the entrance to the vaults of the magnificent church of St. Denis, the resting place of the long line of sovereigns of whose power Clovis laid the foundation. This entry was posted in 5th Century, 6th Century, 7th Century, Ancient, Byzantine, France, Gauls, Middle Ages, Nobility and tagged Henry Shaw, Maps, Medieval costume, Merovingian fashion and history on 10/19/16 by world4. The United States of America after the Treaty of 1783. The Treaty of Paris, which was signed on September 3, 1783 formally ended the American Revolutionary War between the Kingdom of Great Britain and the Thirteen Colonies in North America, who had fought against British rule since 1775. Britain signed separate contracts with France and Spain, which are known as the Treaties of Versailles of 1783. 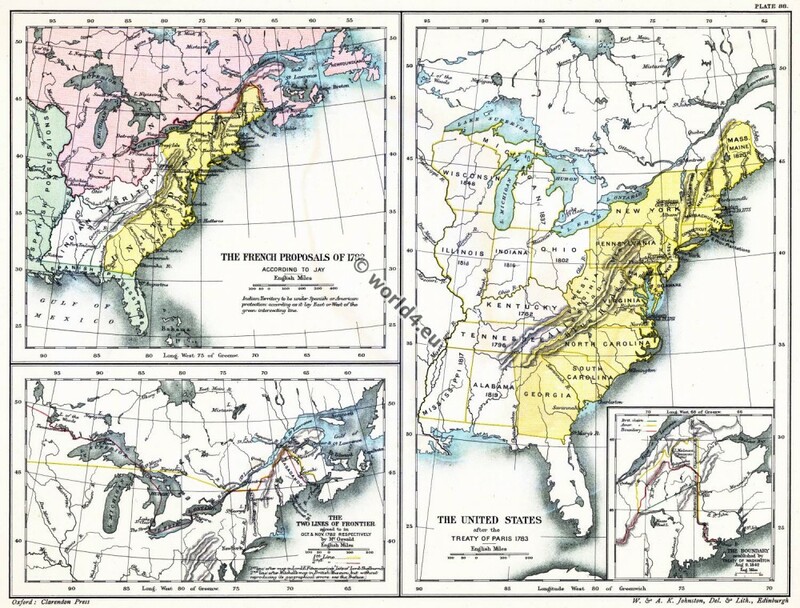 This entry was posted in 1783, 19th Century, North America and tagged Historical atlas, Maps on 10/28/15 by world4. The Barbarian Invasions. The Migration Period. The Migration Period in Europe, 395-527 A. D.
ON the death of THEODOSIUS THE GREAT, in 395 A.D., the Empire was divided between his sons. Flavius Arcadius taking the eastern, Flavius Honorius the western, half. Four Prefectures have now become a fixed territorial division; the realm of Honorius embraces the Prefectures of Gaul and Italy, that of Arcadius the Prefectures of Illyricum (Illyria) and the East (The Diocese of Western Illyricum belongs to the Prefecture of Italy.). 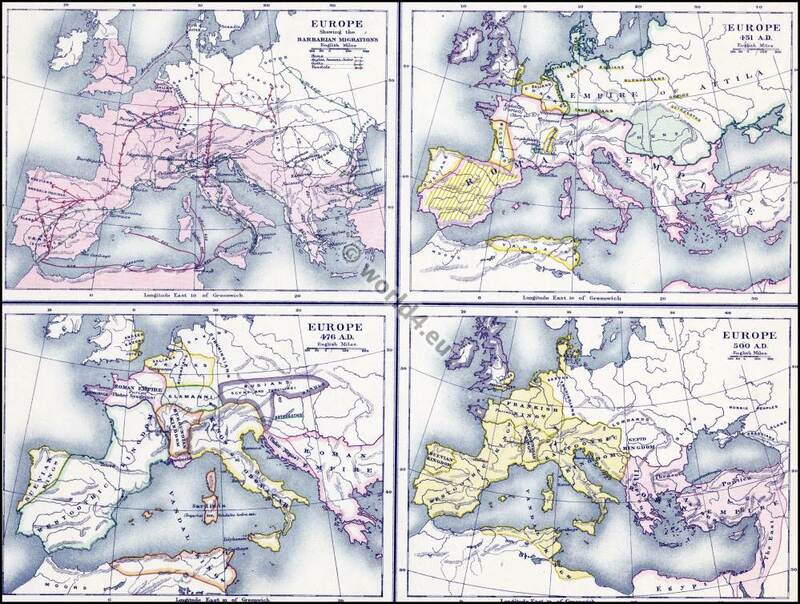 About the same time the invasion of Greece by the Visigoths under Alaric I (396 A. D.) began the series of movements which resulted in the breaking up of the western half of the Empire into German kingdoms-the great historical feature of the fifth century. This entry was posted in 4th Century, 5th Century, Ancient, Celts, Gauls, Middle Ages, Roman and tagged Historical atlas, Maps on 10/8/15 by world4. Roman Empire. 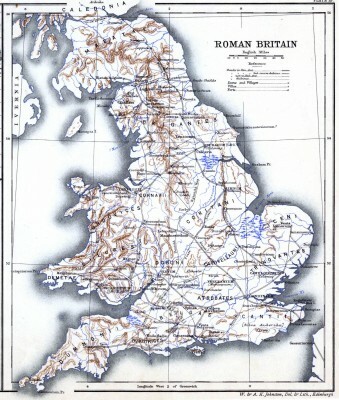 The Romans in Britain. Maps, Places, Tribes. 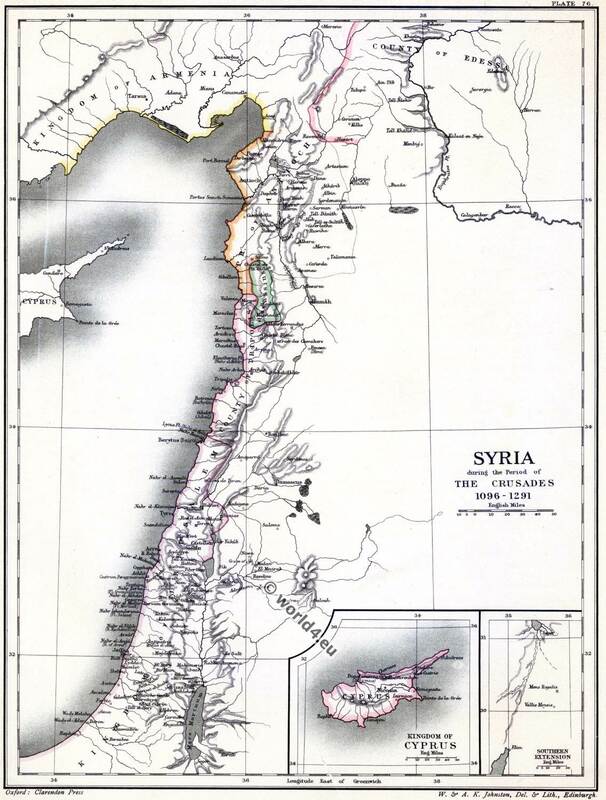 Historical atlas. This entry was posted in 4th Century, Ancient, Celts, England, Gauls, Roman and tagged Historical atlas, Maps, National and Domestic History of England on 10/7/15 by world4. 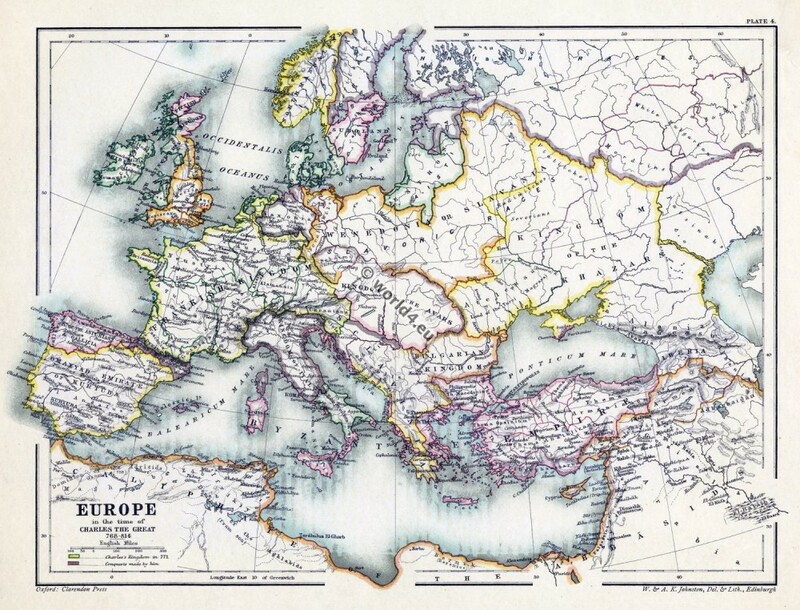 Europe in the time of Charles the Great 768 – 814. This entry was posted in 8th Century, 9th Century, Carolingian, Middle Ages and tagged Historical atlas, Maps on 10/3/15 by world4.